Will These Review Snippets Roll-Out Soon? Google is always performing tests on their search engine results pages (SERPs), and we do our best to track and identify how any changes that are implemented to all users will affect our local SEO campaigns in Jacksonville and across the U.S. When searching for a local company most users add the city modifier to their search query, such as “label printer Jacksonville“. 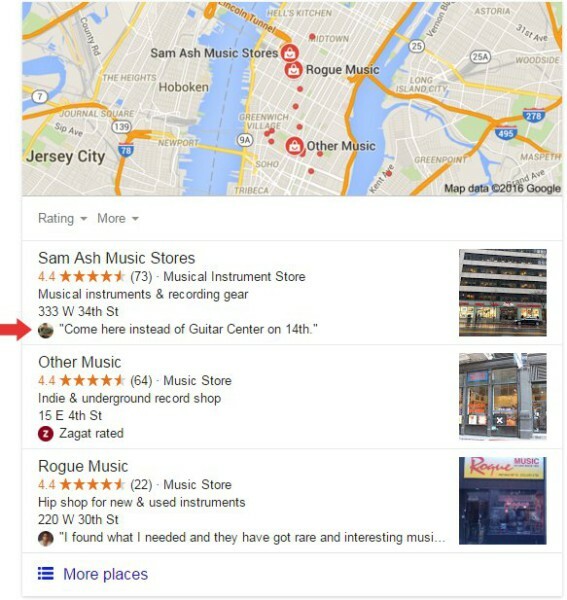 The SERP for most of these local search queries have included a little map featuring local businesses with their point on the map, above the Organic listings. The listings on the map are chosen by Google and are derived from local business listings in the Google My Business database. This section has changed from showing up to 5 businesses with letters A, B, C, D, E, a couple of years ago to what’s now referred to as the “Local 3 Pack”. Peter Meyers from MOZ noticed a review snippet in the Local 3 Pack and posted a screenshot on Twitter. As always, we’ll be watching this local 3 pack to identify changes and apply appropriate SEO and local listing optimizations for all of our digital marketing clients. Have you seen any changes, or do you have a question for us? Let us know in the comments!